Erika Liodice was born with a curious mind, adventurous spirit, and creative heart. She wrote her first book when she was six years old and has been writing ever since. Erika loves being an author because it allows her to follow her curiosity on creative adventures that introduce her to new people, places, and ideas. In fact, the High Flyers series was inspired by this very curiosity. One day, while driving on the highway, Erika spotted a truck with the words “CONTAINS LIVE RACING PIGEONS” stenciled on the side. What are racing pigeons? she wondered. This question sparked a journey that has led her to discover the fascinating sport of pigeon racing, its wonderful winged athletes, and the passionate community of people who raise and race them. 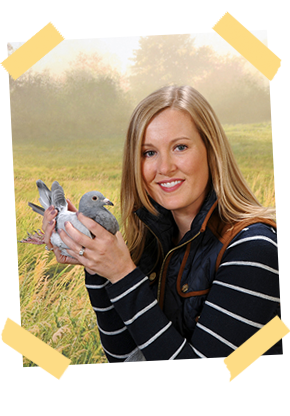 Erika lives in Lehigh Valley, Pennsylvania with her husband, Dave, and their pet racing pigeons.